Everyone is talking about infrared saunas. The hype for these unique inventions ramped up in 2012 when Oprah Winfrey featured them on her show with Dr. Oz. Oz is considered a foremost authority of health and home remedies for various maladies, and his opinion is valued by many. Recently, people have renewed their interest in this unique technology on social media and other platforms. So it’s something worth looking into. Perhaps it could help your health in some way or at least make you feel better or reduce stress. So what did Dr. Oz say about infrared saunas? Medical guru, Dr. Oz said on Oprah Winfrey’s show that infrared penetrates the skin to warm up your body “from the inside out.” This creates an inner heat that does not require the external environment to get hot the way traditional saunas do. Oprah and Dr. Oz went into the sauna and sat down while Dr. Oz turned on the infrared rays. Oprah reported that “It’s getting hot in here” even though the inside temperature did not change. The system works by turning on the infrared which penetrates the skin’s surface that heats the body temperature. Unlike traditional saunas, the heat comes from within your body when it comes into contact with the IFR. Rather than relying on the heat the heat that is generated from the external steam and rocks, the heat comes from within your body. Dr. Oz presented the segment on his show and Oprah Winfrey’s show as a way to illustrate “High Tech Ways to Extend Your Life.” There are many “life extensions” that have surfaced that hold interesting solutions to extending one’s life. Dr. Oz believes that infrared works by providing some specific health benefits. We have listed some of the most important ones below for your consideration. Check out the following health benefits for infrared saunas and see if it something you could benefit from. Then consult with your doctor to get their opinion on IFR saunas, as well. One big benefit of infrared saunas is that you get the same natural rays that you get from the Sun but without the harmful effects of ultraviolet radiation. UV rays have proven to be a danger when exposed in high doses. You should avoid UV rays as much as possible due to the potentially harmful rays that you can come into contact with. Repeated exposure to UV rays has been shown to increase the risk of skin cancer and may also age the skin too rapidly. People who have spent too much time on the beach or in direct sunlight often experience symptoms of aging before people of the same age who do not engage in this behavior. It’s because of the UV rays. Infrared increases your metabolism, according to Dr. Oz’s research so that it helps you burn hundreds of calories without any physical effort. This means that you can use this technique to burn up calories if you don’t have the time to exercise as much as you would like to. Oz reports that you can burn up to 600 calories in just 30 minutes using this invention! That is amazing! Another effect of infrared saunas is that your blood pressure will be lowered slightly much like you may experience when you get into a hot tub or traditional sauna. This helps you to increase vascular circulation which will improve your overall health over time, according to Oz. One of the main things infrared saunas do is to raise your core temperature. This means that the inside of your body heats up even though the outside environment is not hot like a real sauna. This causes you to perspire which in turn, releases toxins and impurities within your body which serves as an overall cleansing effect. In addition to the obvious scientific health benefits you can achieve through this invention, you will also likely experience a feeling of well-being and peacefulness much like you would in a traditional sauna or hot tub environment. It also relaxes you and provides a release of tension for many people. Infrared sauna technology is different than other traditional forms. A traditional sauna uses steam to create heat in the enclosed environment that infiltrates the air. Infrared technology produces real heat that radiates from the light within the spectrum. It produces visible rays and microwaves and penetrates the skin and muscles, rather than the air. This is what produces the “heating up” feeling and effect that Oprah experienced in the experiment she did with Dr. Oz on her show. Where has this technology be used? Infrared sauna technology has been used by NASA for training astronauts to survive in various types of space environments and it has also been used in neonatal units in hospitals to keep babies warm with it. With all of the talk about infrared lately and the use of infrared in saunas, you would think that it was just invented over the last few years. But the invention of IFR saunas is not as new as you think. The first electric sauna stove was created and introduced in 1950. Then 15 years later (in 1965), the first IFR sauna was invented in Japan. You can read more about the introduction of this technology here. Of course, like many inventions, the technology has improved over the years, and it is now available in many different forms for anyone who wants to look into the benefits of this invention. Dr. Oz has always made a practice of only promoting things that help, not hurt people. Whether you take his advice or not is up to you. Certainly, one thing we have all learned over time is that everyone is different. Before you start anything, you should always check with your doctor to see if they think it is appropriate for you. But most people report such great health benefits from it, that few can argue against the use of it based on the results they get. Where do I find infrared saunas? You can find infrared saunas in a variety of retail places. They are available both online and in “real-world” stores. There are various models, as well. Some of them are self-enclosed units that you zip up around you, and they are for use by only one person at a time. Larger units can be installed professionally by tub or shower experts, and these are available at various places on the web, as well. Do some research on infrared spas and saunas, and you may be surprised at what you find out. While we are not claiming that they will improve everyone’s health or mental state in the same way, we had seen numerous incidences of when they seemed to help the well-being and attitude of those who used them. And Dr. Oz believes in them, too which adds to the credibility of this unique invention. Genefood.com is a site that focuses on the genetics aspect of health. 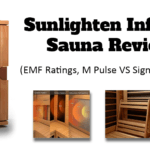 They state on their site that they believe infrared saunas are extremely safe when compared with being in direct sun or using a tanning bed or other mechanism that puts UV rays right above you. As a rule, you should avoid UV rays at all times and focus instead on getting healthy rays from safe levels of radiation like you get with infrared. It is considered much safer than outside sunlight, but you still get the results of sunlight as though you had been in the direct sun. Detoxification is an important part of good health and can serve to cleanse the body of impurities. Harmful chemicals such as mercury, arsenic, and other harmful toxins can build up over time. Mercury levels have been lowered during sauna use in many cases. In one study, 17 of 20 people participating in the study had arsenic in their blood and urine samples after a sauna session. This means that the sauna helped filter out this poisonous toxin and helped purify and detox the liver and kidneys. Other chemicals and toxins were found including cadmium, lead, and others were found in a Russian study that recommended sauna use for removing lead from the body. Based on this information, you could benefit by using infrared saunas as a complementary aspect to a detoxification program to help be rid of free radicals and other harmful toxins that enter the body through the environment. Heart health is important. Saunas have been shown to improve circulation and vascular activity. So infrared saunas may help to maintain and improve heart health. Of course, you should always consult with a doctor or cardiologist if you have a heart condition. But there is no doubt that there are benefits to be derived due to the lowered blood pressure and vascular circulation improvements you’ll receive. If you suffer from pain from joins or muscles such as from arthritis or inflammatory diseases, you may feel a big improvement from saunas. The heat relaxes the muscles as it penetrates below the skin surface which can be highly effective to treat conditions such as fibromyalgia or other maladies that affect the muscular or skeletal systems. Heat from saunas also helps reduce and relieve stress from tense muscles and nerves. Many people have felt relief in their anxiety and stress levels due to the infrared sauna’s heat effects. Most people report that they have been able to lose some weight by using the infrared sauna a few times per week. This is a natural result of the internal heating mechanism that occurs from the infrared. Dr. Oz stated on Oprah’s show that you could expect to burn up to 600 calories in one 30-minute session. One of the chief benefits of infrared saunas is the anti-aging benefits that you get from using it. This is why it is sometimes referred to as a “life extension.” Some even believe you can reverse some of the more common signs of aging such as improved skin condition, more elasticity, and moisture in the skin, and hydration. These are some of the primary components of young skin so that infrared saunas can increase these aspects of your skin. If you go to Niagara Falls, the first thing you will notice is that you immediately start feeling better when you get closer to the Falls. That’s because of the negative ions that the huge waterfalls constantly put out. You’ll feel the effects of it from the fine mist that so much water puts out. This is a positive health advantage, and this has even been reported as one of the healthiest places to live and vacation because of this. While it would be nice to live next door to a waterfall to get this result naturally, not everyone has the option to do this. But the infrared saunas provide a similar effect by increasing the level of moisture within your body that produces a similar effect to negative ions. One finding illustrated how the radiation effects on collagen production was able to increase collagen production and smooth wrinkles and other signs of aging in the skin. In this study, 20 people were given sauna treatments for a period of up to 6 months to see the result. Most participants reported that their skin improved and they noticed a visible improvement in the moisture levels of their skin. Precautionary Statement: While many have reported improvements in their skin due to IFR treatments, others have stated that chronic exposure could lead to decreased collagen. So that’s why it’s important to follow the advice of experts and limit exposure to around 20 minutes at a time. As with any good thing, there are a few risks that you should be aware of before you invest in this technology. -You should avoid alcohol before using the sauna and stay hydrated. -You should only engage about twenty minute sessions at a time a few times per week. -Talk to your physician if you have any heart problems. -Negative side effects can include profuse sweating, fatigue, and reduced sperm motility in men. As you can see, infrared saunas have many advantages, despite the cautions that experts give in using it. Like any great invention, using caution and knowing your health situation is important to take into account before beginning any program of sauna therapy. The heat infrared saunas generate holds many health benefits that you will have to experience for yourself. Here’s to your health and may you have a long and healthy life! Hey Matt…1st, thanks for all your doing to bring true and real evaluations of Saunas, because there is a lot of “horseshit” out there! Just wanted to add to your post above. I have come to trust Mercola a lot, and he has a really good talk about NIR, FIR, and what Full Spectrum really means. And another article about using a NIR Sauna to help detox. I can’t prove or disprove everything said, but it gives some meaning and definitions to many question I have had about how our body receives and use infrared. I hear you, but Mercola is not a good candidate to compare NIR saunas with sunlight in my honest opinion. He walks every day on the beech, grounded, no shades… more from the sun than any of us could ever possibly get from a NIR sauna. Thanks so much for posting these links, I’ll revisit them and make some new videos about these NIR saunas I built. It probably comes across like I don’t like heat lamp bulbs at all, but that isn’t t he case. (I have them hanging in my FIR sauna 😉 ) I just hate seeing people pay $3,000.00 for 4 $10 bulbs, a stick frame, and a cloth tent is all.